Myers Briggs Test * What is your Myers-Briggs Personality Type? So what do those 4 letter cryptic MBTI code mean? Our free online Personality Test based on the Myers Briggs Personality Indicator (Cognitive Style Inventory) is designed to assist in verifying your Myers Briggs personality type score. On a SMART PHONE? Try our mobile-friendly free online personality test. This modest self-scoring inventory is Not a substitute for taking an in-person MBTI ® from an experienced MBTI administrator. It is a tool I developed to introduce my clients to personality type or psychological type and to help validate the results I received from administering the MBTI ® personality assessment. I hope it whets your appetite for learning more about the Myers and Briggs model of personality development and its message of increased self-understanding and understanding of others and our "differing gifts." The Style Inventory will allow you to approximate what are your MBTI Type preferences. After determining your 4 MBTI Type letters, you can jump to a number of links we have provided to help you get acquainted with the characteristics and indicators of the 16 types and verify if your type, as determined by this "unscientific" survey, seems to "fit" or not. © As the Cognitive Style Inventory is intended to be used on the Internet, linking to this page is permitted. However copying or reproducing this inventory, in whole or part, is prohibited without the express permission of the author. Determining one's natural Myers Briggs Personality Type is frequently complicated by our life-long learning experiences. The classic question is: " Am I this way because I learned it or is this just the way I am?" In reviewing the comparisons in our personality assessment, you may find yourself drawn equally to opposing personality preference choices. In such cases I suggest you try to think back to how you were before the age of 14 or even younger if you can recall. The rationale for this suggestion is the fact that by the time we are 3 years old, the core of our cognitive organization is well-fixed. . . although the brain continues to allow some plasticity into puberty and in some cases throughout life. After the onset of puberty, our adult learning begins to overlay our core personality - which is when the blending of nature and nurture becomes more evident. For some people, this "learning" serves to strengthen what is already there, but with others it produces multiple faces to personality. Discovering or rediscovering this innate core of yourself is part of the journey of using personality types to enrich your life. Each of the four questions of the CSI inventory has two parts. The first part is a general description of the preference choices. The second part is a list of paired statements. Use both parts to form your opinion on your more dominant preference. Q1. Which is your most natural source of Mental Energy ? Every person has two faces. One is directed towards the OUTER world of activities, excitements, people, and things. The other is directed inward to the INNER world of thoughts, interests, ideas, and imagination. While these are two different but complementary sides of our nature, most people have an innate preference towards energy from either the OUTER or the INNER world. Thus one of their faces, either the Extraverted (E) or Introverted (I), takes the lead in their personality development and plays a more dominant role in their behavior. Q2. Which way of Perceiving or Understanding is most "automatic" or natural? The Sensing (S) side of our mind notices the sights, sounds, smells and all the sensory details of the PRESENT. It categorizes, organizes, records and stores the specifics from the here and now. It is REALITY based, dealing with "what is." It also provides the specific details of memory & recollections from PAST events. The Intuitive (N) side of our mind seeks to understand, interpret and form OVERALL patterns of all the information that is collected and records these patterns and relationships. It speculates on POSSIBILITIES, including looking into and forecasting the FUTURE. It is imaginative and conceptual. While both kinds of perceiving are necessary and used by all people, each of us instinctively tends to favor one over the other. Q3. Which way of forming Judgments and Making Choices is most natural? The Thinking (T) side of our mind analyzes information in a DETACHED, objective fashion. It operates from factual principles, deduces and forms conclusions systematically. It is our logical nature. Q4. What is your "Action Orientation" towards the outside world? All people use both judging (thinking and feeling) and perceiving (sensing and intuition) processes to store information, organize our thoughts, make decisions, take actions and manage our lives. Yet one of these processes (Judging or Perceiving) tends to take the lead in our relationship with the outside world . . . while the other governs our inner world. A Judging (J) style approaches the outside world WITH A PLAN and is oriented towards organizing one's surroundings, being prepared, making decisions and reaching closure and completion. A Perceiving (P) style takes the outside world AS IT COMES and is adopting and adapting, flexible, open-ended and receptive to new opportunities and changing game plans. - What is your "Super Power" - Which Mental Process is at the center of your mental being? - Hidden Letters of Personality Type. - Learning about the Dynamics of Myers Briggs Personality Types. - Practical Business and Organizational Applications of Myers-Briggs & the MBTI. - - Job Search, Career Planning & the MBTI. Cathy Newman & Jordan Peterson: ESTJ, Feeling, and Cognitive Dissonance. CAPT - Center For Applications of Psychological Type . . . The Education and Research Foundation established by Isabel Myers and Mary McCaulley. Experts Respond to: Why the Myers Briggs test is totally meaningless. * While sometimes referred to as the MBTI Personality Test, Myers-Briggs Personality Test, the Briggs Myers personality test, Myers Briggs Test or the MBTI test, the MBTI ® is not a personality test but a personality inventory or instrument in which there are no right or wrong answers. Verifying your Myers-Briggs Personality Type. New Article: Changing Donald Trump's Personality? Impossible Dream? Finding your "True" Myers Briggs Personality Type. Hidden Letters of Personality Type. Learning about the Dynamics of Myers Briggs Personality Types. Practical Business and Organizational Applications of Myers-Briggs & the MBTI. 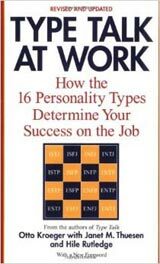 Job Search, Career Planning & the MBTI. Lenore Thomson on Carl Jung & Personality Type. The Faces of Personality Type Development. Personality Types & Emotional Intelligence. Are They Really Problem Students? Former Google employee James Damore raised the question of gender differences explaining the difficulty of high tech employers like Google obtaining proportional representation of women in high tech jobs. What does the data on Personality Type offer for this dilemma. Teaching Assistant Lindsay Shepherd's confrontation with University speech police and the possible role of personality type in creating the university environment. President Donald Trump: His evolving personality - normal or not for his personality type? 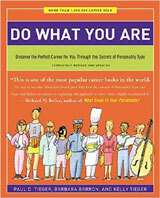 Very popular and durable career book by Paul and Barbara Barron Tieger. It has been updated for newly emerging careers. Useful for self-study or as an aid to career counseling professionals.